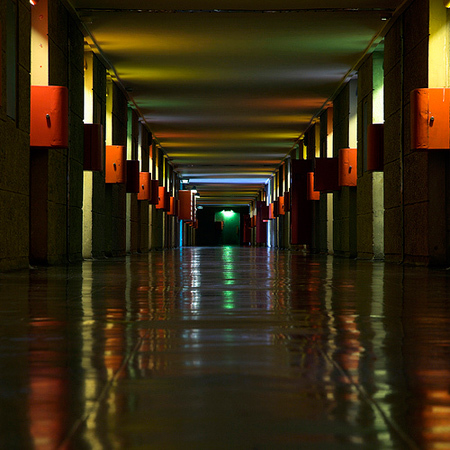 Architecture: Le Corbusier’s Unité d’Habitation – liner, hotel, hostel or worse? 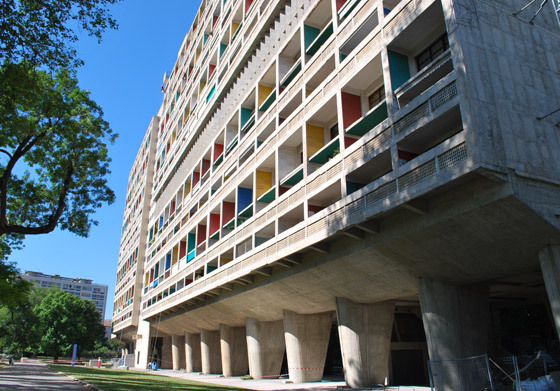 For Le Corbusier, the Unité d’Habitation in Marseilles was nothing less than an ideal architectural and urban form into which all of his research and principles about modern life, housing, and urbanism were distilled. 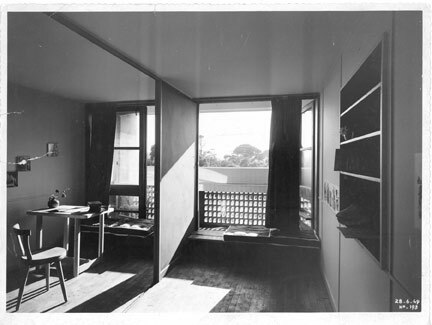 Le Corbusier’s aim was to provide a quality of life and housing that was hotel-like and where residents would effectively becoming guests in their own homes. Designed as a self-contained, self-sufficient community, the Unité was influenced by three design precedents in particular: the monastery, with its seclusion, privacy and sharp distinction between the life of the individual and that of the collective[i]; the Phalanstère[ii], an ideal building-type dreamt up by the 19th century utopian socialist Charles Fourier, and the ocean liner[iii]. To achieve the desired level of self-containment in the Unité, Le Corbusier included every facility deemed necessary for daily life. As well as 337 apartments, the roof housed a kindergarten, nursery, paddling pool, gymnasium and running track. A shopping centre was arranged along elevated ‘interior streets’ on the seventh and eighth floors as was a restaurant, snack bar and hotel. As far as Le Corbusier was concerned, the notion of self-sufficiency was not only central to his concept for the building, it provided the key to successful communal life. Le Corbusier had started to conceive of the communal housing unit as a hotel long before the design of the Unité. The entrance to his 1922 immeuble-villas concept was hotel-like spatially and in terms of its operations, ‘The usual cramped building entrance with their inevitable concierge’s room is replaced by a large hall. 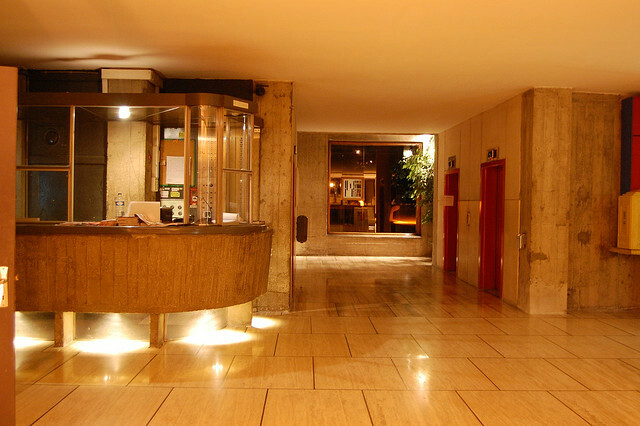 Doormen on day and night duty admit visitors and show them to the elevators.’[iv] Thirty years later Le Corbusier delivered on his earlier plan, creating a lobby-like entrance that retained the materials, finishes, features, and functions more associated with elite affluence than mass housing. These included an elaborate porte-cochere, large plate-glass entrance doors, stained-glass feature walls, feature lighting, highly polished travertine floors and a concierge’s desk. The elision of home and hotel was accentuated further by the location of the hotel reception and accommodation on the same floors as residential apartments. Guests and residents would also share entrances, elevators, cafés, restaurants and shops. One of the main spatial effects was the creation of a transitional space imbued with all of the liminal, anonymous qualities of the hotel lobby that now extended all the way from the building’s entrance to the threshold of each and every private apartment[v]. It also served to accentuate the distinction between public spaces and private residences, or ‘cells’ as Le Corbusier called them, in a linguistic hangover from his monastic precedent[vi]. 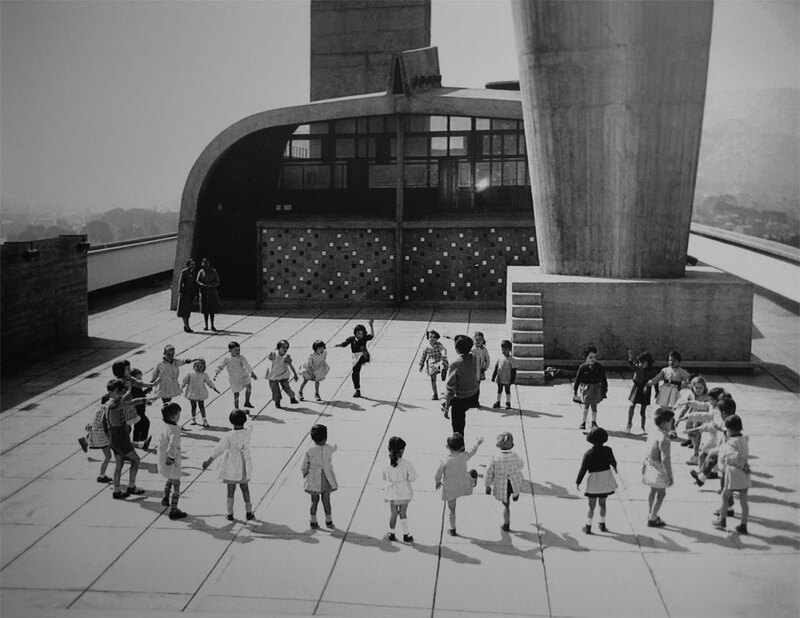 At the Unité roofs became playgrounds and corridors became streets in the sky. Le Corbusier had created a building that challenged accepted distinctions between the public and private, individual and collective, resident and guest. As Carsten Krohn has discussed[vii], the Unité has always aroused strong architectural and critical passions and this may have something to do with its subsequent influence on a whole generation of architects, and those engaged in the design of social housing in particular. 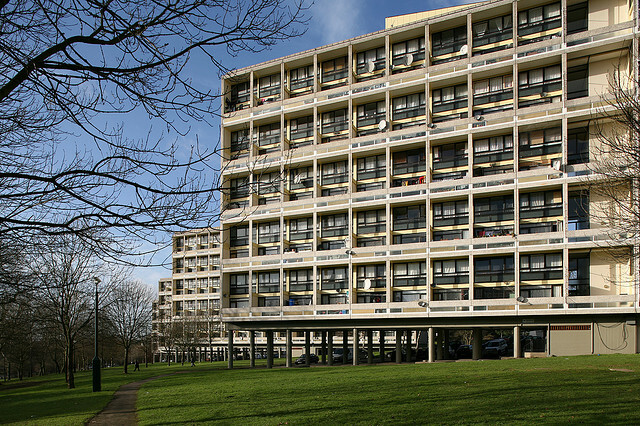 In the UK alone, the Unité had a direct influence on the LCC’s Alton West estate, Roehampton (1958), Jack Lynn and Ivor Smith’s Park Hill estate in Sheffield (1961) and Chamberlain, Powell & Bon’s Barbican Estate in London (completed 1982) [viii]. [ii] See Peter Serenyi, ‘Le Corbusier, Fourier and the Monastery of Ema’, The Art Bulletin, Vol.49, No.4 (Dec., 1967) for a detailed discussion of their influence.